We were doing pretty well with our math curriculum…and then bam, lost one due to some changes that they weren’t ready for.. Ok, found a good substitute for him… And then bam…another one ended up spending hours every day on math work. That just isn’t ok in our house. 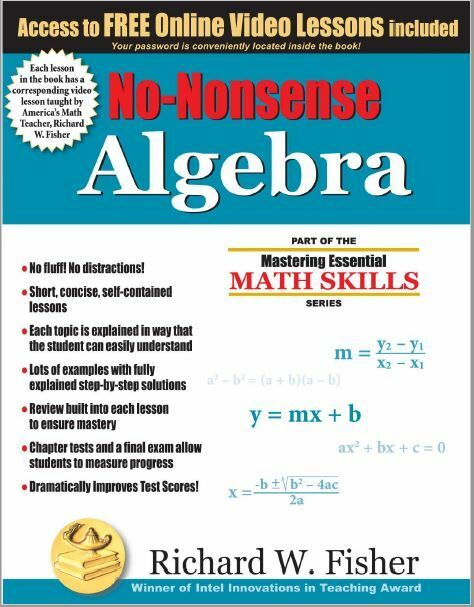 I had heard great things about No-Nonsense Algebra from Math Essentials so I was excited to have Lauren try it out..
Now, we have tried so many different things for Algebra.. And I was surprised that this was just a book when we got it. But it’s NOT just a book! Inside the first page is a code that you can use at the website to get videos for each lesson! I will talk about those in a minute.. I had Lauren start at the beginning of the book, just to see if this book went along with what she already knew or did things differently. That makes a difference! I highly suggest doing that whenever you switch a math curriculum! The beginning was definitely easy so we started out doing a lesson every day. As it got more involved I had her doing four lessons a week. We are still doing that amount each week. There is room in the book to write answers down, but I figured that I would just make up a little worksheet that had room for answers. She could also do her work on that page if she wanted to, or use another piece of paper if the questions are a little more difficult. This also makes it easier to grade later. When it comes to grading, I go over her answers and mark the incorrect ones and she can go over the ones that she missed to see what she did wrong. This seems to be a good system for us with this book and she finds it a better fit than what we were doing. The videos are fantastic! There isn’t any fluff it is just straight forward explanations. Everything is step by step and it builds on what you have already learned in each lesson. This is part of one video. You can see how each step is clearly gone through. Richard W. Fisher is the author of the book as well as an award-winning teacher, and he narrates each video lesson. He has a very easy voice to listen to and he talks in such a way that you just understand everything he says! You can see that there are a few different equations added now on the same screen. They are similar, but different enough that you will be able to do various questions easily now that you have watched them being done. As you move further along, you can see that the equations get a little tougher, but there are still plenty of explanations going on. I love that each lesson in the book is quite short. It starts with a quick introduction letting you know what the lesson is about and provides some helpful hints. Then there are some examples with a few steps. The exercise section has all of your questions. There aren’t ever that many, I would say 16 has been the average. At the end are about four review questions. These just make sure that you understand what you have learned so far. If you want to read what others thought of their experience with No-Nonsense Algebra, feel free to click the banner below! just how easy it’s whenever you buy generic. be built online so your company grows stronger. became inward bound links without thee other action. Opeen Command Prompt – Under thee Start Menu, type CMD inside thhe search bar.